Simon & Schuster, 9781501135002, 304pp. The “searingly honest, brilliantly written” (Delia Ephron, New York Times bestselling author) memoir of a woman trying to reinvent her life who finds, after her divorce, that true freedom to make any choice means being free to make every mistake. A thirty-something journalist living in Brooklyn, Heather Chaplin has to acknowledge the obvious: her marriage is over, and her career is stagnating. When she summons the courage to leave her husband behind, her life turns into an emotional roller coaster. She is soon dating a cast of characters in New York until an impulsive trip to Ireland thrusts her into the orb of a magnetic man named Kieran. But just when she believes herself to be on the brink of what she’d always wanted, a series of setbacks throw her into a volatile spiral downwards. Her independence becomes a frightening prison. As she struggles to find her way back to the world she once knew, she must confront the reality of the past to find her way to the possibilities of her future. Narrated with a uniquely provocative voice, Reckless Years is a raw, propulsive debut: unfailingly profound and impossible to put down. Chaplin writes about all the things women aren’t supposed to say or feel: rage, manipulation, sexual desire—even madness. “Dramatic, adventurous, and heartbreaking” (Kirkus Reviews), yet ultimately redemptive, it is the story of losing yourself in the middle of a comeback and finding yourself in the most surprising of places. Heather Chaplin is a writer living in Brooklyn. She’s written about all kinds of things in her journalism career and is the founding director of the Journalism + Design program at The New School. In the evenings, she can be found taking ballet classes she has no business attending but does anyway. Reckless Years is her second book. 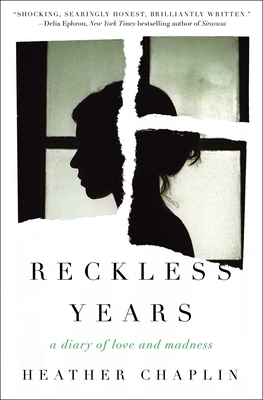 "Reckless Years is a stunningly forensic account of the end of a marriage and its aftermath, which combines the honesty of memoir with the urgency of good fiction and a dry wit that, for all the darkness of the story, makes Chaplin a joy to spend time with."